AFP has developed better digital communications to provide a new online experience to engage, inspire and educate members, supporters and friends. As members of AFP, we are committed to upholding AFP’s Code of Ethical Standards, the Donors' Bill of Rights, Culture of Philanthropy and Donor-Centered Fundraising when serving our organizations and the donors and funders who support them. As such, we directly benefit from distinguishing ourselves through our professional fundraising, nonprofit management and social impact. 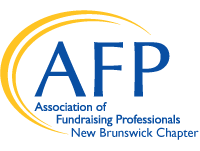 AFP New Brunswick Chapter offers valuable education and networking opportunities to help meet the needs of fundraisers at all levels. Also, a job board to support our members, organizations and those looking for employment in the sector. By continually building our knowledge and skills, it’s our hope that our combined efforts will lead to stronger outcomes and stronger communities. If you're interested in philanthropy, fundraising and nonprofit management, we welcome you to join us for an AFP New Brunswick Chapter program or event. Interact with us on the live discussions or reach out to your peers using the directory tab. There are many value-adds for each and every member in this new website design and we look forward to hearing your feedback!